This is where the likes of Hendrix, Nirvana and Pearl Jam cut their teeth and still to this day you’ll find a wealth of live music venues, promoting every genre from grunge to orchestral. Other popular draws include: poetry slams, book fairs and a unique wide-screen cinema which is one of only three in existence. Aside from the attraction for younger travellers, Seattle also holds plenty of worthwhile things to do for a more general audience with film festivals, art galleries, zoos and aquariums providing lots of options from morning through to night. 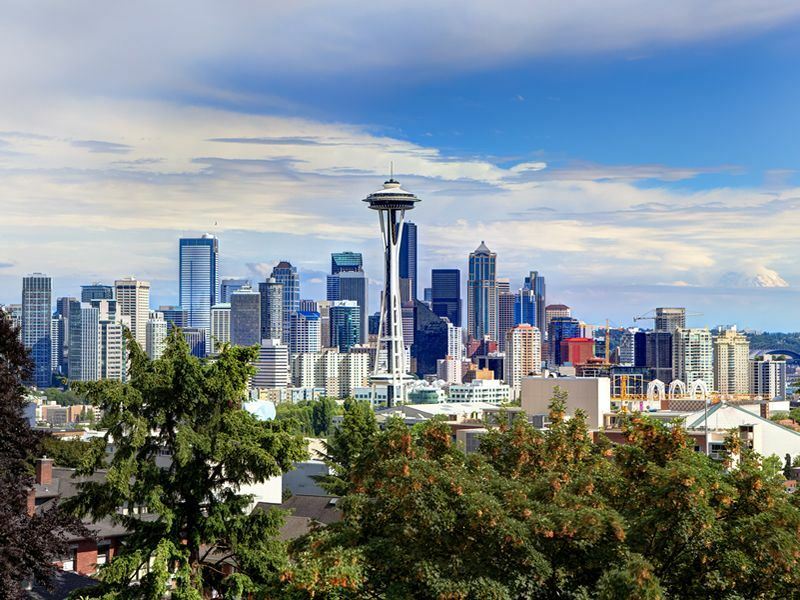 From Frasier Crane to Starbucks, the Space Needle to the Freemont Troll, Seattle is all things to all people and if you’re looking for just a taste of The Emerald City then check out the top 10 things to do in Seattle below as a great place to start. Known locally as the The Croc, this live music venue has been belting out the tunes since the early nineties with only a 2 year hiatus towards the end of the noughties. Well known for its propensity for playing it loud and featuring the likes of: Mudhoney, Alice in Chains, Nirvana, the Beastie Boys, REM and Pearl Jam, anyone who wants to sample a genuine piece of Seattle’s musical history needs to step foot in here if only to sample the pizza and beer served in the Back Bar throughout the week. Situated with views over the Elliot Bay, Pike Place holds a legendary status in the hearts and minds of the locals as not only is it one of the oldest of its kind in America it also aims to support people on low-incomes as well as selling some darn fine produce. Pike Place is where the world and his wife come to eat, meet and live so if you have the time to join the flower-sellers, fishmongers, craftsmen and fresh fruit &amp; veg merchants then prepare yourself for a little slice of history as well as an authentic taste of Seattle. Fondly known locally as just SAM, this art gallery in the downtown district has sister sites on Capitol Hill and on the Central Waterfront and in total the three facilities hold over 25,000 pieces of art work. The main museum features modern and ethnic art as well as some huge sculptures including the Hammering Man who stands in pride of place at the entrance on First Avenue. With a suggested admission price throughout the week and free admittance on the first Saturday of the month this is an affordable and fascinating option, especially on a rainy Seattle afternoon. Featuring almost 100 acres of space, the Woodland Park Zoo is an award-winning facility and regarded as something of a pioneer in the art of immersing people into animal habitats. In particular, the zoo’s gorilla area has been used as a template across the world for naturally exhibiting wild animals and alongside interactive playgrounds and hand-crafted carousels, kids will be in their absolute element. Zones include: Australasia, African Savannah, Southeast Asian and tropical rainforest, to name but a few and no trip to Woodland is complete without a visit to the Peruvian penguins which combines cliffs and pools within an eco-friendly environment. This public park is well over 500 acres in size and contains literally miles of walking trails that take in some of the city’s most intrinsically beautiful natural sights. Thanks to Discovery Park’s location, along the shores of Puget Sound, you can expect to find plenty of chances to spot wildlife and from seals and sea lions to almost 300 different species of bird, this is a real oasis away from the city streets. Meadows, beaches and historic buildings, such as Fort Lawton and West Point lighthouse, make a trip to the park far more than just another patch of grass from where to enjoy a quiet lunch. Situated on the south side of the Seattle Centre Park, this science museum is a not-for-profit organisation and originates from the displays used in Seattle’s World’s Fair back in the early 60’s. Today you’ll be treated to eight different buildings which include one of the largest laser dome theatres on the planet as well as not one but two IMAX cinemas. There’s also a tropical butterfly zone, a planetarium and untold amounts of interactive puzzles, games and displays to keep the whole family amused or confused for hours on end. If you’re hoping to get a view of Puget Sound but don’t fancy the ferry journey then pay a visit to Seattle’s Great Wheel which resides on Pier 57 and is the tallest of its kind on the west coast, standing at an enormous 175ft. This Ferris wheel only opened in 2012 and has 42 gondolas that take just over 250 passengers high up and over Elliot Bay. Open all year round and offering rides until midnight at the weekends this is a great idea for an evening out and quite a romantic location if you have any important questions to pop. Located to the south of downtown Seattle, in the Boeing Field of the King County International Airport, this aviation exhibition was established in the mid-60’s and features more than 150 aircraft. Some of the most note-worthy pieces include: the first flight-ready Boeing 747, the BA Concorde 214 and the world’s first ever pressurised sailplane, the Lamson L-106 Alcor. This is much more than a museum purely for airplane buffs and exhibits dedicated to space flight and aviation history help to create a truly memorable experience. Thes wonderful museum Chihuly Garden and Glass recently opened in 2012 and can be found within the 74 acre Seattle Centre which is well-known for its park and dedication to arts and entertainment. The museum itself showcases the glass-sculpting talents of Dale Chihuly who’s a Washington local and renowned for his glasswork that is often used for installations and as an environmental expression. This is the largest exhibition of Chihuly’s work and well-worth a visit if you’re anywhere near Harrison Street. With a pinnacle over 600 feet tall and weighing in at almost 10,000 tonnes it’s pretty difficult to ignore this space-age looking structure that was originally built back in the 60’s for the World’s Fair. Located on Broad Street and offering trips via lifts travelling at 10mph, the Needle is a great box to tick off when visiting Seattle and although the queues can be long the views from the observation platform are well worth the wait. For your financial security the air holiday packages shown are ATOL protected by the Civil Aviation Authority. Our ATOL number is ATOL 9759.